Given by Mr G. Lofting, 18 June 1991. The donor acquired it from a member of the U.S. Airborne Division, about 1941. Oval-sectioned, black-painted composition grip, with an angled end, secured by five brass rivets. Brass cross-guard with lobate quillon terminals inclined slightly away from the blade. Single-edged blade, widening towards the tip to form a curved cutting edge, like a cleaver, with a clipped back edge. There are two parallel incised lines running along each side of the blade, parallel with and close to the back, extending as far as the beginning of the clipped edge. 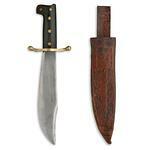 Brown leather sheath, made of a single piece of leather, stitched up the inside face, with a belt suspension loop attached to the inside face by two rivets. The outside of the sheath and both sides of the suspension loop are tooled with a freeze composed of leaves. On the front face, towards the top is a tooled panel enclosing a the same crest as on the blade (see under Marks below) with the word 'LEGITIMUS' below; below the panel is stamped the number '13'. Condition on acquisition: Generally good. The cutting edges of the blade have signs of extensive sharpening. The end of the sheath is creased, and there is a slit near the mouth which has been repaired with glue; minor scuffs and markings elsewhere. On the inside of the blade:'COLLINS & CO' / the crest: out of an eastern coronet, a human arm erect, holding in the hand a hammer / 'LEGITIMUS / MADE IN USA. / No. 18'. 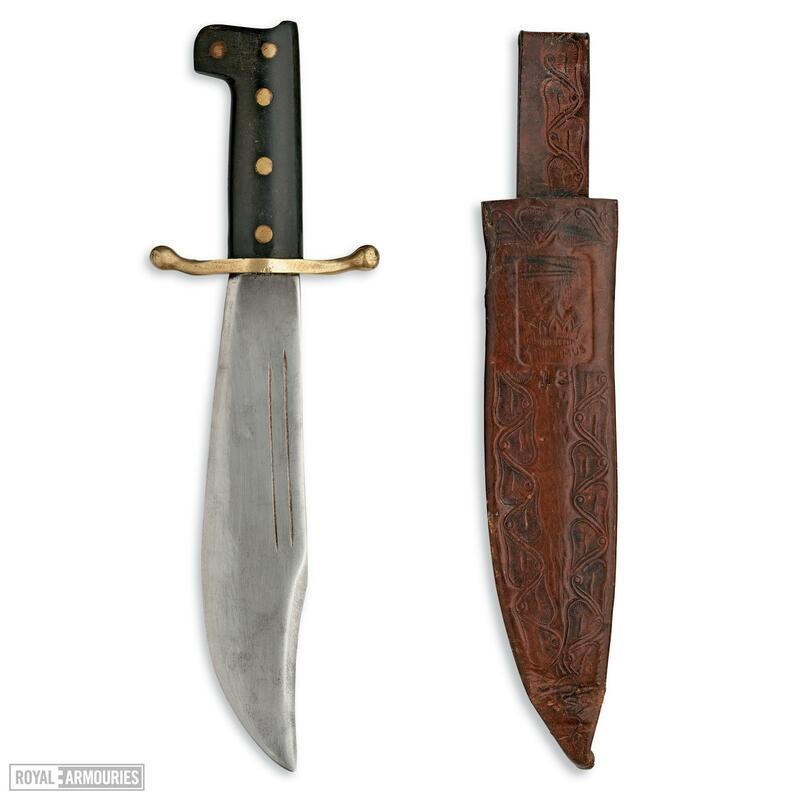 The donor said it was a common practice for members of the U.S. Airborne Division to carry such knives on their belts with a pistol holster in front of the sheath. From the markings, the decoration of the sheath, and the general finish, this seemed, at the time of acquisition, unlikely to have been an offficial military issue weapon. However, a similar example, by the same maker, but without the tooling on the sheath and with a buckle on the end of the belt-loop, was included in Kent Sales, Sale No.168, 2nd November 1990, Lot 208 (ill. in cat.) where it was identified as a U.S. V44 Survival Knife, citing M.H. Cole, 'U.S. Military Knives', p.136. See also F.J. Stephens, 'Fighting Knives...', London etc., 1980, pp. 66-7, nos 318-22.